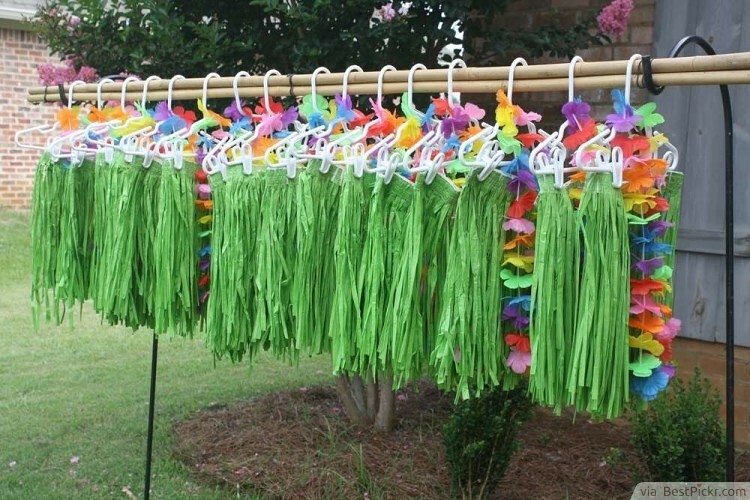 Provide your guests with dress up outfits of grass skirts and lei (or, in other words, bright flower garlands) to make your Hawaiian themed party really lively! The men can also wear the garlands of flowers; vivid patterned Hawaiian shirts are always a hit, as well. 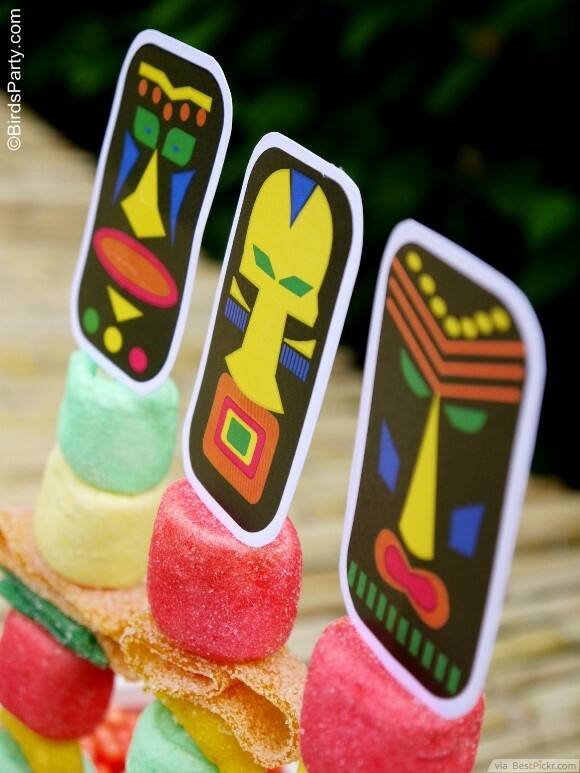 Take soft candy, marshmallows, exotic fruit, and string them together on a BBQ skewer atop of which you stick a hand-printed totem pole. You’ll find plenty of designs on the Web; for best results use photo-quality paper. 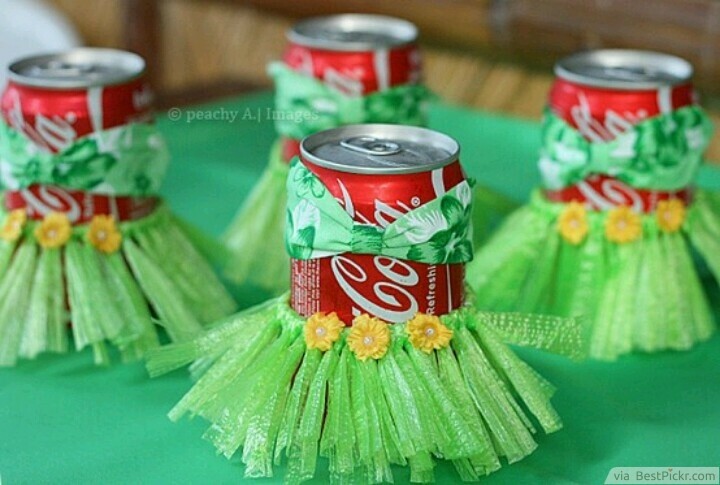 Great Hawaiian luau party ideas for adults too. Don’t throw away the skin of your pineapples once you’ve taken away the tasty fruit. Cut it carefully and turn the skin into a vase for your beautiful peony and orange blossoms. 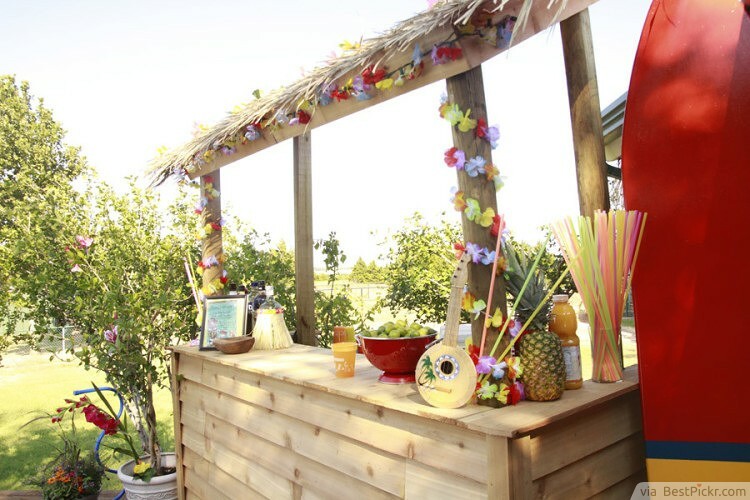 Setting up a tiki bar is an impressive decoration for any Hawaiian themed Luau party, which you can keep and use for years to come! 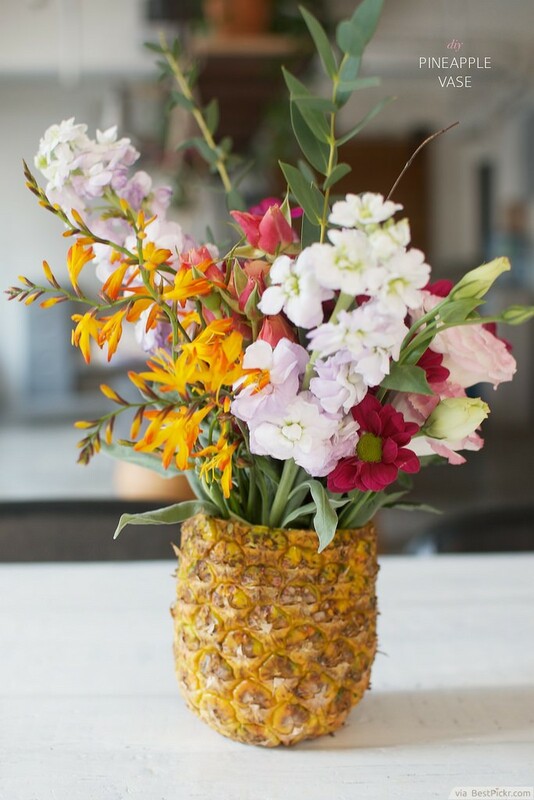 Serve your cocktails and punches from behind a wooden bar, which you can decorate with tropical fruit, coconuts and bright decorations such as garlands of flowers. This is one idea which your guests will love, and which will become a talking point of the night! 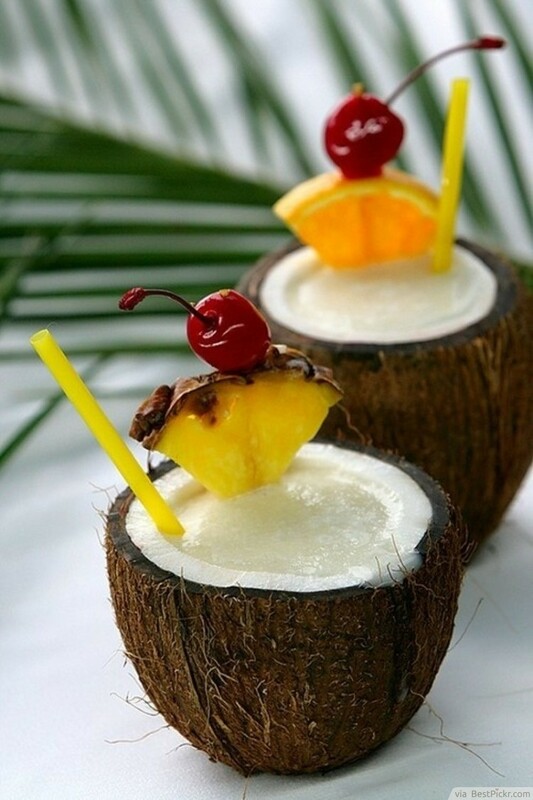 If you're planning to throw a Hawaiian Luau party, you simply have to include coconuts somewhere along the way! Traditionally they're used to serve drinks, so discard your plastic cups in favour for coconut halves. 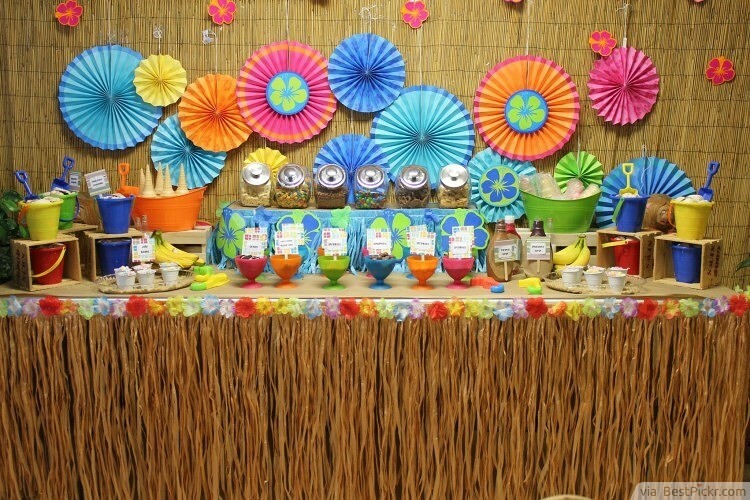 Alternatively, coconuts can be used in a whole variety of ways at a Luau party, including as costumes or decorations. There's no end to appropriate themed things that coconuts can be used for! Add flavor and color to your Hawaiian Luau Party with tasty ice-cream stored in colorful toy buckets with miniature shovels for the guests to serve themselves. Enrich the setting with bamboo wickerwork, bright paper flowers, candy jars, and bananas. Exotic, tropical fruits such as pineapples are perfect foods for guests at a Luau party. Instead of eating them on their own, why not incorporate these fruits into other traditional party food? 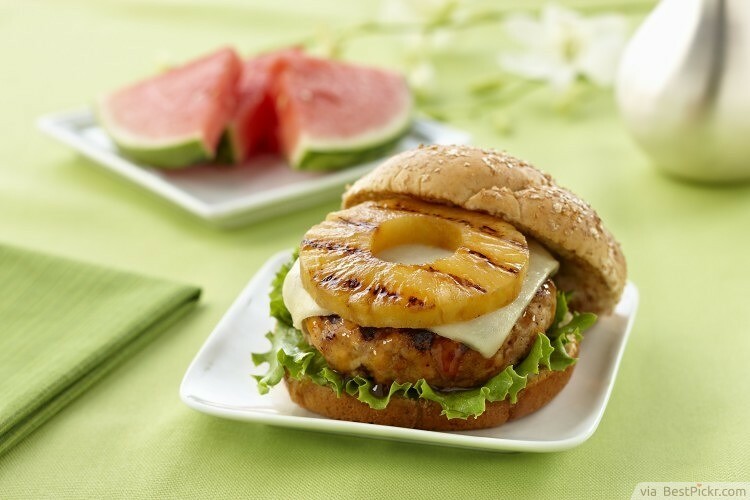 Add slices of pineapple to juicy burgers for Hawaiian themed food which is both delicious and easy to eat! 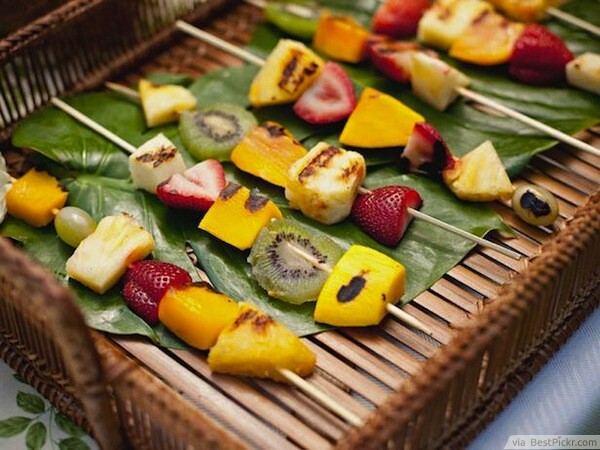 Forget about roasted meat -- go instead for a fruity barbecue with pineapples, kiwis, strawberries, apples, bananas and other fruit that strike your fancy. Pierce them with a skewer and fry them or eat them raw. 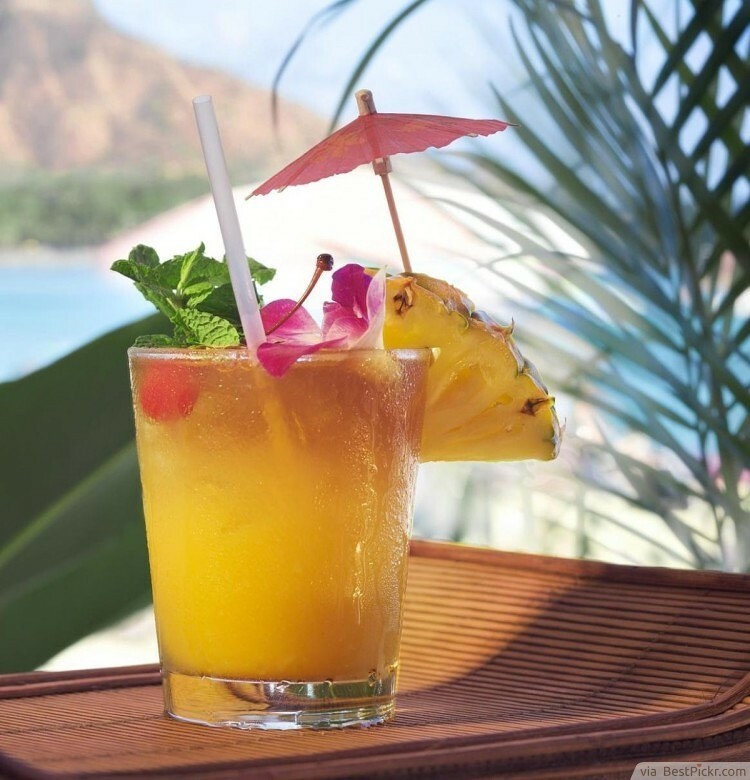 Drinks at Luau theme parties should be fruit punches – if you can, use the most exotic and tropical fruit juices as you can. Think pineapple, grapefruit and watermelon, to name just a few ideas. Of course, for the adults you can add an alcoholic twist – and don’t forget the paper umbrella to top it all off!